This quick and easy chicken casserole is packed with flavor! Great for having company over, making for gatherings, or freezing for a later date, this dish might just become your go to meal! Veggies and chicken combined to make a complete meal! 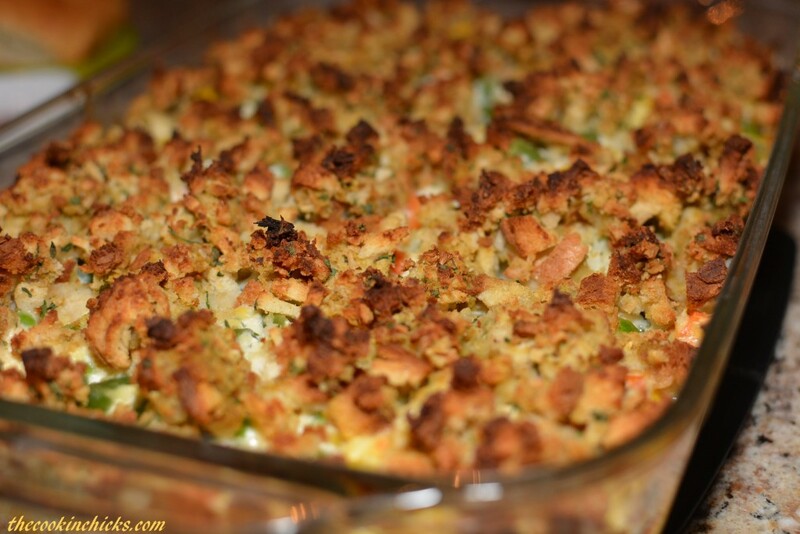 One of my family’s most favorite casseroles in this Chicken and Stuffing Casserole. Why? Because it is SO flavorful, simple to make, and most of the ingredients are ones that you would have on hand already. It is kid friendly and we always have leftovers to take for lunches the next day, or dinner the next evening! If you need to bring dinner to a friend, host a dinner party, or simply want to make a quick and easy dinner for your family one night, definitely try this!! A quick to prepare, budget friendly, family approved casserole that feeds tons! An all in one meal, this is a hit! Spray a 9 x 13 baking pan with cooking spray. Preheat oven to 400 degrees. In a bowl, combine the chicken, cream of chicken soup, sour cream, veggies, salt, pepper, and garlic. Spread mixture onto bottom of prepared pan. Prepare stuffing according to packaged directions. Spread prepared stuffing evenly on top of chicken mixture. Place pan in oven and bake for about 30 minutes, or until chicken is cooked through. Serve! We have this recipe but it doesn’t call for chicken to be shredded. I just use the whole chicken breast, but I think the shredded chicken might cook quicker. And you could also use canned chicken in a pinch. We’ve also used cream of mushroom soup if didn’t have cream of chicken. Love this recipe!! Yum is right! That sounds delicious!! 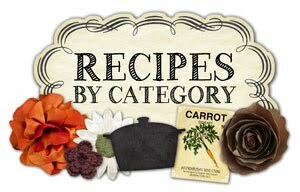 I just saw your site from someone who had posted one of your easy, on hand items, recipes. It looked wonderful, so I came on your site and I am impressed with your site. Thank you. Awww thanks!! Welcome to the page! So glad you connected with us and enjoy it!! Do you cook the frozen veggies first ?? How big is a package of stove top? I bought the one in a cylinder can!! Yep!! Whichever you have on hand will work great!! Hi, the recipe says cooked and shredded, but the instructions say “until chicken is cooked through”. For the cooking time, are you actually putting raw chicken, or cooked chicken in the pan? Thanks – looks yummy!! Absolutely delicious!!!! Easiest recipe ever!!! Do you cook the stuffing first? THANK YOU,TTHANK YOU, THANK YOU.I was getting tired of cooking chicken , and my family was going eating tired of it too, but this they loved and it was so easy to prepare.WWe loved this it taste great. You are so welcome! Glad they enjoyed it!!! i dont have sour cream, will it be okay without it? Do you use raw chicken or are you cooking it first? Hope you enjoy this, its a family favorite!! 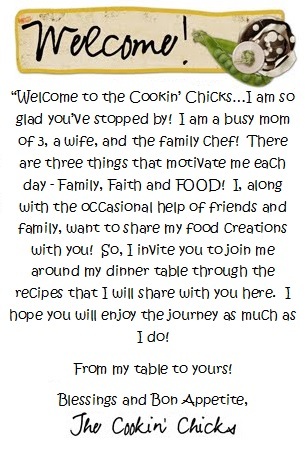 Can’t wait to receive all of your interesting recipes! Oops, I see recipe has been changed to cut up chicken. My vesion said shredded, so ignore question. No problem! Shredding would definitely be difficult without cooking, hehe!! Hope you enjoy this!! Sure! That would work just as good! Awwww, I am so glad it was a hit!! Good job!! Hope you had a wonderful Thanksgiving!! I’ve been making this for years, since the recipe is right on the back of the Stove Top Stuffing box. Nice! Yep, the original recipe is on the back, however, this one has been changed slightly. Both are great though, thanks! I put my raw chicken meat in the food processor and make ground chicken out of it, it mixes up nicely with the ingredients and bakes up great. I’ve made a similar variation of this recipe, I use either leftover chicken or turkey. Heat together 3/4 block of medium cheddar cheese with a can of cream of chicken soup and 1/2 can of milk and some frozen veggies. Add cooked rotini, fusilli or macaroni, then put the stuffing on top. Heat all through in the oven before serving. Delicious comfort food. Oooooo that sounds wonderful! I will need to try your variations soon!! Although this looks good, mine is more “Lactose Intolerant: friendly. Both my daughter and I are lactose intolerant so I have had to fins ways to be creative so that we can still have that creamy, comfort food. That’s great that you tweaked this to make it lactose intolerant friendly!! Its definitely a yummy recipe!! Great idea! I bet that’s great too!! hi what is ‘stove top stuffing’ in uk please? Has anyone prepared this dish and then frozen it and made it at a later time? I was thinking of preparing the dish and freezing it but waiting to make the stuffing for the top until the day I am going to bake. I would actually rather be able to make it all and freeze and just pop it in the oven. Not sure it it would turn out ok. Has anyone tried this either way? Will this come out thicj enough to dit on a plate with other foods? Pot luck bible study. Will doubling the recipe be ok? Make that thick enough to sit on a plate with other foods. I did that once and it worked out great!! Hope you enjoy! Oh for sure! 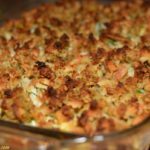 I have doubled the recipe before to make 2 casseroles and it works great! Definitely thick enough to serve on a plate with other foods! Hope its a hit!! Can I make this up a couple of hours before and then bake it when ready? Yep!! That is typically what I do and it works great! Enjoy! Can you use the precooked deli roaster chickens foundin the grocery store and shred or chop them up? Definitely! Just take some cooking time off since the chicken is cooked already! Would you do anything different to this recipe if you use homemade stuffing? Nope, just prepare stuffing and place on top prior to baking!! Enjoy! Oh no! Sorry about that! Hope it was a hit though!! I don’t know why some who don’t like sour cream think that they won’t like it in the recipe??? You can’t even taste it yet gives it some zing. Anyhoo….I guess I don’t like frozen mixed veggies. Would rather add my own especially green beans. Corn would be great too! Great I idea for Thanksgiving leftovers, using turkey. Can’t wait to try this, for sure! Can you sub rotini or similar pasta for half or 3/4 of the veggies? That ‘s for the non veg eater that is my husband!! Hmmmm, I would say up to half, no more, only because the pasta will absorb a lot of liquid and may be dry. 1/2 should work though! Enjoy! Can I use thin cut chicken breast? Does one use “raw “ chicken or need to cook first…??? Yes, raw chicken, you will cook it once assembled! Sorry but I found this kind of bland and boring. 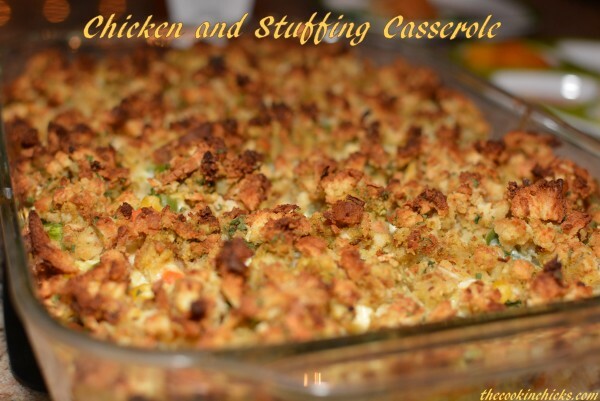 I really wanted to like this because it was easy to make and I really love stuffing. Oh bummer! You can always add flavor by tweaking the amount of spices/seasonings! Bummer it wasn’t a hit though! Do you shred chicken or cut it into pieces? Cut the chicken into pieces, it goes in raw and cooks once assembled! Enjoy!! Nope, chicken is raw prior to assembling. Every oven is different, as well as thickness of chicken, so you may need to adjust time slightly! Sounds Great! Will add some onions and celery (cook a bit in butter) like turkey dressing! This looked amazing (even mine did), but, sorry to say, it was just wet and bland. I followed the recipe exactly, except I used 2 boxes of stuffing (one did not come close to covering the top of a 9×13 dish), and the chicken breasts took an extra 20 minutes til they were cooked. I have deleted the recipe from my notes. Oh bummer! Sorry to hear you didn’t enjoy this!